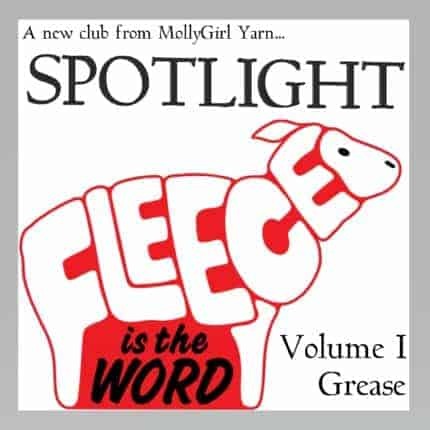 Fleece Is The Word – Volume I of MollyGirl’s New Spotlight Club Is Now Open For Sign-ups! Hi Untangled friends! I’m hoping you’re filled with Summer Lovin’, ready to do the Handjive, and fly off into the sunset in Greased Lightin’… Sign-ups for our new club, Spotlight, are finally open! Volume I is all about the classic coming-of-age musical, Grease! The concept behind the club is that we’ll feature a different musical or musician in every Volume. Participants will get five months of colorways celebrating the best songs from some of your favorite artists, shows… and perhaps other forms of media? (Can anyone say an “Ocarina of Time” Volume? I may or may not already have all of those colors planned… Perhaps…) It gives me a chance to really explore some of these timeless classics and idols in a yarnful way and perhaps expose you yarnies to new music that wasn’t on your radar before. It also gives me the chance to do one of my favorite things and create fun new colors with abandon… and gives you the chance to get your hands on what will almost certainly be unrepeatable colors! Needless to say, I am really, REALLY stoked about this club. When I came up with the idea for this club, it was a natural segue for me to jump to Grease as my first Volume. A lot of people don’t really know this about me, but I used to be really active with my local community theatre when I was young. Grease is the first musical I was ever in; it was a kids/teens-only production my theatre company did over a summer. Predictably, it was pretty terrible. But it was a gateway for me into something I never thought I could do. Being involved in that show changed my entire life, changed who I was at a very pivotal point for me, and it’s something I wouldn’t change for the world. So yes, I did wear an actual poodle skirt, I do know all of the words to Summer Lovin’, and I can handjive with the best of them — something I can say with a strange sense of pride. In a way, this sort of brings it full circle for me because I think this club can really be something amazing, too! In the club, you’ll get one shipment per month starting in September. Each shipment will include yarn in a brand new, never-before-seen (and probably never-to-be-seen-again!) colorway. Each participant will also get a special club-exclusive enamel pin! This Volume’s pin was designed by my dear friend, Xandy Peters, and is just ridiculously cute. What yarns and what weights you get are up to you! You can pick from one of three options: Bass Line, Rock Star DK or Rock Star. You’ll get the same number of skeins every month in the same yarn every month. This makes it easy to plan project sets or large projects! Want to do a set of socks for a Grease-loving friend? Hats for your Pink Ladies? The ultimate Rydell Fadient — can you say “We Go Together?” Whichever you choose will be amazing and I can’t wait to see what you do with them! Space is strictly limited, so don’t wait too long! Sandy was no stranger to heartbreak – but you can avoid her fate by signing up early! You can pay all at once or in monthly installments: either way, it’s peachy keen, jellybean. More in-depth information can be found on the listing page. If you have any questions, feel free to reach out.